Main Message: The Earth’s distant past is connected to the present and shapes people’s future. Life and the Earth have always changed together and affected one another. Today, humans are agents of this change and will continue to be. Understanding the planet’s deep history helps people interpret the world they live in today and predict how the human species and others might fare in the future. Background: The field of paleontology has changed significantly since the early 1980s, when the current hall was last renovated. The understanding of ancient life and its connections to the present and future has expanded, and huge numbers of new fossils have been collected. The current exhibition is outdated and does not showcase the museum’s unparalleled fossil collection. 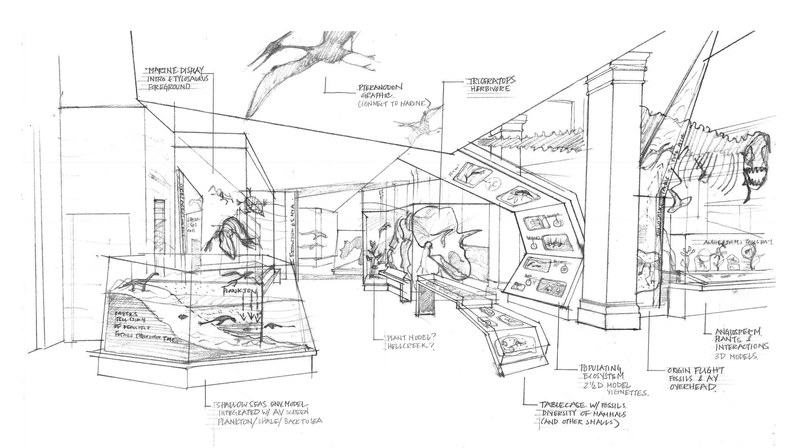 Creating the dinosaur and fossil hall will involve the largest, most extensive structural renovation in the museum’s history. Interior walls put into place during the past century will be removed, structural columns relocated, all electrical and mechanical systems updated, windows and skylights replaced and the wing’s historic atrium will once again be revealed. The project will also include extensive specimen work. More than 2,000 specimens will be removed, conserved, remounted and reinstalled between the hall’s closing in April 2014 and the opening of the new dinosaur and fossil hall in 2019. Many of these specimens are gigantic, complicated and extremely fragile, including the 90-foot-long Diplodocus. These specimens need serious conservation so they will be strong enough to display for future generations. Major Areas of the Exhibition: The exhibition is structured as a journey through time. Most visitors enter through the Rotunda and will begin their journey in the recent ice ages, traveling back to the beginnings of life and the formation of the Earth itself. There are 10 major geologic time period sections and two major extinctions in the exhibition. A “Bridge” section, focusing on the Anthropocene (the current era of humans) will serve as the center point of the exhibition. A FossiLab area will combine a working fossil-preparation space staffed by experts with hands-on, interactive activities and specimens that will allow visitors to explore the scientific process of asking questions and exploring evidence. Flowing above the largest specimens in the hall and tracing a path will be the “Stream of Life,” a structural, artistic installation that will capture the concepts of time and life as ongoing, connected, ever-branching and periodically affected by major extinction events. Anthropocene: Talking about the Anthropocene and humanity’s global impact is a new and important area for the museum. The goal of this section is to provoke reflection and discussion among visitors without being preachy and demoralizing. The museum’s exhibition team is gathering information from climate-change communicators and world experts on the Anthropocene. It is also talking with visitors to learn about their concerns and listen to what they find compelling about these concepts. The museum is exploring many options to create an experience for its visitors that will spark conversations and create engaged citizens for a changing planet. Websites: Deep Time and Facebook/Deep Time.